Classic Army is a leading manufacturer of Airsoft products, setting standards for the entire industry. 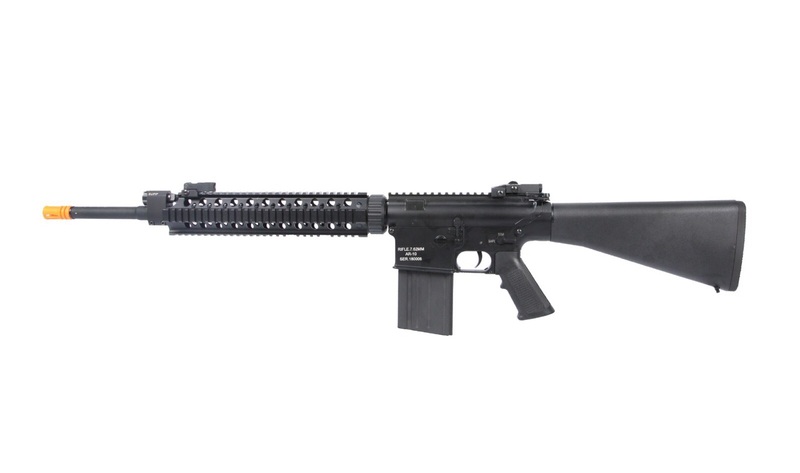 This model of the Classic Army AR-10 will ship directly from the manufacturing center. Additionally, the AR-10 is priced lower since the product is coming from Hong Kong! This is literally one of the best deals on Earth considering the package can ship to any country where its legal. It's time to get your hands on this affordable deal coming straight out of the factory! The CA AR-10 comes stock with a metal AR-10 receiver that is bulkier and wider than the standard M4/M16 bodies and allows for greater magazine capacity. The full stock accommodates a large battery to support power upgrades. It also comes with flip up front and rear sights. The rear sight is adjustable for both windage and elevation. The full metal RIS allows for easy installation of all the accessories you need in the field such as lasers, flashlights, and bipods. What type of magazine does this use? Are there additional magazines available for sale?